The FEU Tamaraws (Tams) listed their th win after they beat the NU Bulldogs, 77-75 (Bulldogs) yesterday in their 2nd Round meeting in the UAAP Season 75 that was held at the SM Mall of Asia Arena. The Tams have avenged their 1st Round defeat against the Bulldogs. This win is two times sweeter for the Tams because for one they have bounced back from a demoralizing defeat against the Blue Eagles and second, they have placed themselves in the 2nd spot of the Team Standings, thus they are within striking distance from getting the First Spot which is occupied by the Blue Eagles as of the moment. This win of the Tams is identical to their win against UST in the opening day of the UAAP Season 75 Men’s Basketball. Just a little flashback... the FEU-UST game was a close match all throughout. It went down to the last 10 seconds of the ball game wherein Jeric Fortuna committed a turnover on one end and then RR Garcia made a game winning lay-up on the other end to seal the win for FEU. 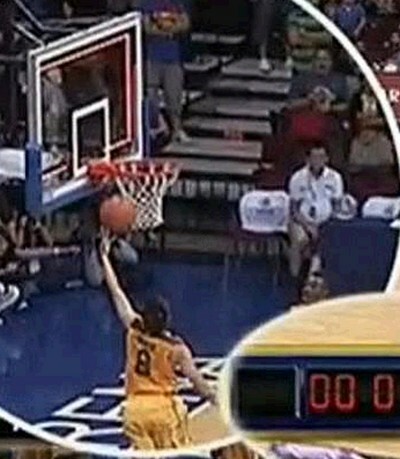 That was the exact thing that happened in this FEU-NU game. Bobby Ray Parks made an error and then FEU regained possession. RR Garcia received a quick outlet pass from one of his teammates. He made a game winning lefty lay-up just in the nick of time. The lay-up was reviewed several times by the Refs and they later on declared that it was good. When the replay video was zoomed in, it was clear that RR released the ball just before the game clock expired. I agree with the Refs because if you will look at the picture above, the direction of the ball when it is already airborne is straight upwards. The ball is already fixed on a straight direction free from a primary external factor - RR's hand. Thus, we can say that RR's left hand, to be exact, his fingertips no longer have contact with the ball, otherwise, the force of his fingertips will be enough to alter the straight path of the ball towards the ring. The lay-up should definitely be counted. RR Garcia made another MVP type of a play during crunch time. He didn't score that much in this game as he had only 10 points, but he made the game winning shot that matter most. That shot gave FEU this all important Win. A win that will brighten up their future come Final 4. Romeo, Escoto and Hargrove also contributed heavily for FEU. Check out the individual scores below. Scoring per quarter: 16-20, 35-29, 51-58, and 77-75.